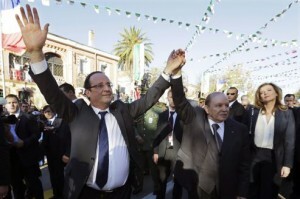 France’s desire to build a relationship with Algeria may always be thwarted by colonial past. History has a way of making its presence known, years after the events that helped shape it are forgotten by a majority of the world. It is almost as though it wants to remind us that accepting the past is the only way to move into the future. Perhaps the best contemporary example of this fact is President Francois Hollande, president of France, visiting Algeria, a former French colony. France ruled over Algeria for 132 years, and its rulership was largely discriminatory and suppressive towards the indigenous population. Nevertheless, last month President Hollande made a trip to Algeria, with the mission to better relations with the former colony. However, the positive aspect of the trip was overshadowed by the fact that President Hollande never formally apologized to Algerians for French crimes during the colonial period. The controversy over France’s lack of repentance cannot be understood unless a little bit of history is drudged up. French colonization of Algeria began in 1830, and by 1848 the country was officially annexed as a départemente of France. Indigenous Arabs and Berbers were displaced from their land, as traditional tribal methods of farming and controlling land were replaced with an agricultural method that was economically beneficial for the French. The much smaller French population became an elite class that quickly marginalized the natives economically, culturally, and politically. Tensions finally came to a head in 1954, when revolutionary sentiments came to a peak, and Algerians began an eight year long war for independence. The violent and bloody conflict eventually ended with negotiations, and Algeria formally gained its independence in 1962. Since then, the country has been fraught with internal leadership tensions, between Islamist political parties, the military, and liberals, and is slowly trying to establish its own identity in the world. The violence and goriness of the past has not been forgotten by Algerians today, and many have been pressing France for an apology. These circumstances bring us to the events that occurred last December, when President Hollande stated he was not saying sorry for France’s behavior. However, he did remark that, “For 132, Algeria was subjected to a brutal and unfair system. This system has a name: it is colonialism, and I recognize the suffering colonialism inflicted on the Algerian people.” The quote is most definitely somber and heartfelt, but it brings to mind a myriad of questions. Two of the most pressing questions are why is the president drudging up Algeria’s past, and is it enough to fix relations between the two countries? The answer to the first question is rooted, unsurprisingly, in politics and economics. Thousands of Algerians migrate to France every year, and President Hollande gave out promises to streamline the visa process, and make a better effort to integrate Algerians into French society. According to the French president, the bettering of human relations on the immigration front will mutually benefit the two countries, particularly France. The French economy has been suffering as the global economy continues on its downward spiral, and President Hollande hopes to increase trade with its former colony. As of today, Algeria and France’s annual trade amounts to only 10 billion euros, a rather low amount seeing as how Algeria has over 12 billion barrels of oil reserves. Other countries, like China and Russia, enjoy favorable relations with Algeria, and this has benefited them economically. Unfortunately for France, I fear that President Hollande’s words do not match his country’s actions. France has been known for poorly treating its large Arab population, and has become a nation overcome with Islamophobia. Extreme right politicians like Marine Le Pen have made their dislike for immigrants and the presence of “radical Islam” in France obvious, and this sentiment has been steadily spreading throughout the nation. According to a Stanford University research study, Muslims are 2.5 times more likely to experience job discrimination than any other racial or ethnic group in France. These statistics, combined with the overall racism directed towards Arabs, has led Algerians to be wary of France’s abilities to build a positive, sustainable relationship with their country. Perhaps the best way for the French government to prove that it is willing to work on its bond with Algeria is to ameliorate racial tensions at home. Laws against job discrimination must be passed, and the Arab population, many who are second or third generation French, should be integrated into society. Correcting injustice within France will be the most powerful message that can be sent to Algerians abroad, and it may very well be the perfect nonverbal apology. Until this happens, history will continue to remind Algerians of a past that is filled with nothing but disappointment and pain.